She was a rock star. Her first novel, The Heart is a Lonely Hunter, brought her critical acclaim at the age of twenty-three and she made her mark on the literary scene of the 1940’s and ‘50’s at a time when the field was still overwhelmingly dominated by men. Her body of work hauntingly echoed the themes of loneliness, unrequited love, and being different. A southern gothic writer, she railed against racism and homophobia – and her message still resonates today. Her name was Carson McCullers. While living in a Brooklyn brownstone called “February House” with a menagerie of other writers and artists, she wrote The Member of the Wedding. When she was in residence at Yaddo Artists’ Colony, she penned The Ballad of the Sad Café. Later, as her health was failing, her home was a Victorian with a wrap-around porch and a view of the Hudson River, not far from where I grew up. Each time I passed by that house, I imagined Carson, decades earlier, sitting on her porch, peering from her window as she sat at her typewriter, perhaps walking down South Broadway in the mornings. When I came upon a grainy, 1958 recording of her reading from her work, I was awestruck. There was a fragility in her voice, which quivered, as though she were about to cry. That shakiness, along with her thick Georgia accent, conjured in my mind an elderly southern lady rather than a woman who, at the time, was only forty-one-years-old. 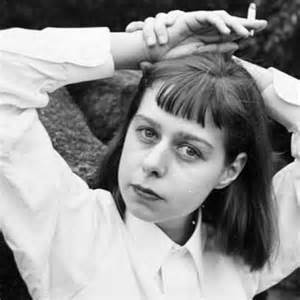 Carson McCullers left us a beautiful literary legacy. Whether you’re looking for a thought-provoking book for yourself, or a good-read for your book group, her prose is lovely and her message will surely ignite great discussion. I loved “The Member of the Wedding” and was so happy to see it performed by Julie Harris along with the other famous actors. Do you remember “Seventeenth Summer” by Maureen Daly (I think that’s the correct spelling.) Also a coming of age novel with the heroine a little older. My mom gave it to me when I was about fourteen or fifteen and I was surprised that she gave me a novel wherein a boy and a girl share a romantic interlude and a “KISS.” You do sometimes have me recall early times in my life. Thanks for the memories.